Yield and Price Change from Planting to Harvest-How Strong is the Relationship? Arguably more is written and said from May to November about US corn and soybean yields than any other factor impacting US corn and soybean prices, likely excluding 2018 and the tariff war. This article examines if the change in corn and soybean prices from May to November reflects a yield focus. Percent change in yield is measured from the May World Agricultural Supply and Demand Estimates (WASDE) to the November WASDE (US Department of Agriculture, Office of the Chief Economist). May WASDE is the first to report yields for the upcoming crop. Such yields were first reported May 1993. The 2017 WASDEs are the last to be used in this analysis. Price change is contemporary with the WASDE yield change. It is measured as the percent change in the closing price of December corn and November soybean futures on the day of the WASDE release. The market is thus given time to react to the report. Futures prices through 2013 are from Barchart, then from the Wall Street Journal website. The estimated relationship does not necessarily imply causality, although higher yields would mean higher supplies that could cause lower prices, and vice versa. Besides US yield, many other factors impact price. Percent change in yield is more akin to an indicator variable whose estimated coefficient contains not only the impact of yield change on price change but also the impact of all demand responses to a change in yield as well as the impact of other variables correlated with yield change. The coefficient is thus not a precise measure of yield change’s impact on price change; however, the coefficient is consistent with the way in which many market participants think of the relationship between yield change and price change. Percent change in US corn yield between the May and November WASDEs is associated with 48% of the corresponding percent change in December corn futures price. As can be seen in Figure 1, a visible downward relationship exists between yield change and price change. The comparable value for US soybeans is 12%. 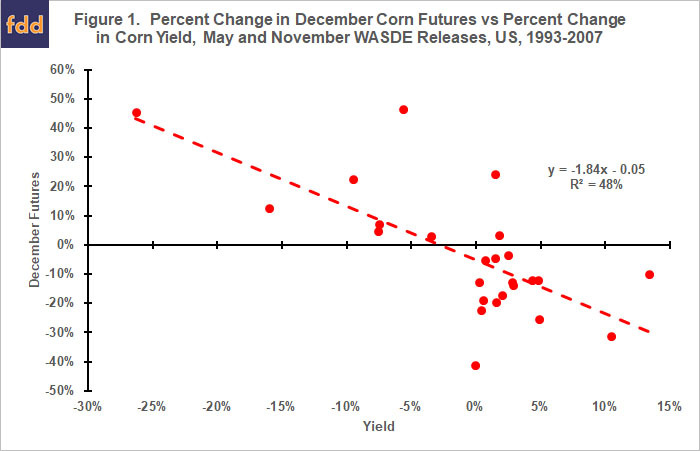 Again, a downward relationship exists between yield change and price change (see Figure 2). The estimated relationships for corn and soybeans are significant with 99% and 95% statistical confidence, respectively. Coefficient on yield change is -1.84 for corn vs. -0.86 for soybeans. A negative sign is consistent with the expectation that higher yield implies more supply and thus lower price, everything else the same. A more negative coefficient for corn is also expected since the elasticity of demand with respect to price is commonly found to be less elastic for corn. Thus, the same change in supply is expected to be associated with a greater change in the price of corn than soybeans, everything else the same. The preceding question particularly applies to soybeans. The question should not be a surprise. US corn and soybeans now account for only about 30% of world feed grain production and only about 20% of world oilseed production. 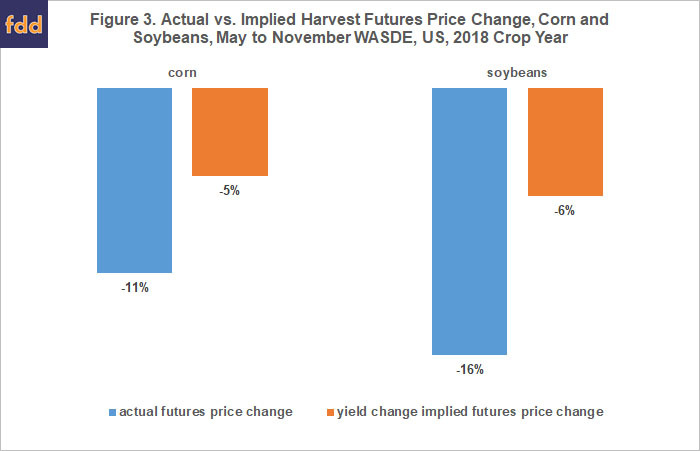 Multiplying the -1.84 corn yield change coefficient by the 3% increase in corn yield from the May 2018 WASDE to the November 2018 WASDE generates an implied 2018 price decline of -5% for corn (see Figure 3). 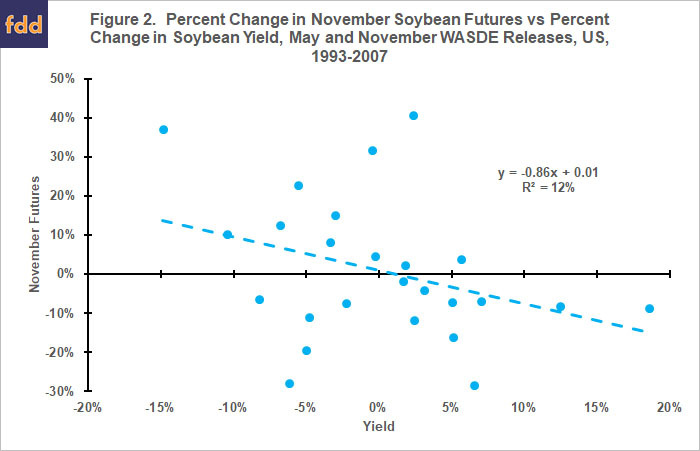 Multiplying the -0.86 soybean yield change coefficient by the 7% increase in soybean yield between the two WASDES generates an implied 2018 price decline of -6% for soybeans (see Figure 3). December 2018 corn and November 2018 soybean futures prices actually declined -11% and -16%, respectively. Comparing actual 2018 decline with the implied 2018 decline needs to be done with caution for reasons discussed in the data and procedures section. A larger actual price decline suggests other price factors had a collective negative impact on price in 2018. The tariff war is clearly one of the other factors. Given China’s importance to US soybean demand, it is not surprising that the actual price decline differs more from the implied price decline for soybeans than for corn.